Napanee's Cam Harris, sporting a pink jersey, battles for a puck in front of his own net during Friday's game at the SPC. Photo by Adam Bramburger. A pair of wins over the weekend allowed the Napanee Raiders to match history in both season wins and points, all while creating headaches for their potential playoff first round opponents. Their 5-1 win over the Port Hope Panthers at home on Friday coupled with Sunday’s 4-2 road victory against the Gananoque Islanders gave the Raiders 37 wins and 75 points, matching the previous high water mark set last season. This year’s team however required 42 games to achieve that total compared to 2017-18’s club which played 40. While the Raiders entered the weekend with just history to play for, the games were of extreme importance to the Panthers and Islanders, who are locked in a dog fight for the fourth and final playoff spot with just one week to go in the regular season. The Panthers entered the weekend with a two point advantage in the standings. After falling behind 2-0 to open Sunday’s game against the Islanders, the Raiders rallied back with four unanswered to secure their franchise record-tying win. Gananoque’s Kyle Casford scored the game’s first goal 11:32 into the first. That 1-0 score held until the six minute mark of the second, when Gananoque’s Nick Maillet doubled the lead. Ryan Casselman got the Raiders on the board at 8:47 of the second while Evan Foley tied it up with just under three minutes to go in the period. Liam Mroueh, making his Raider debut, put Napanee ahead just 2:37 into the third. Casselman iced the win with an empty-net goal in the final seconds to secure the 4-2 win. Bailey Maracle started the game for Napanee but was pulled at the 26 minute mark. Nicholas Nabuurs finished the game, stopping all 13 shots he faced. Former Raider Jeremy Piazzi took the loss, making 52 saves. On Friday the Raiders donned pink jerseys and potted four goals in the opening 20 minutes en route to a 5-1 victory over Port Hope. Bailey Matthews scored 3:09 into the game, followed just 11 seconds later by Devon King. Cullen Hinds and Matthew Panetta each added one of their own for a 4-0 lead heading into the first intermission. After a quiet second frame Hinds picked up his second of the night just shy of the 13 minute mark of the third. Port Hope’s Jacob McPhee broke the shutout in the final minute and a half with a power-play goal, but that was all the offense the visitors could muster. Nabuurs earned the win with 16 saves while Port Hope’s Curtis Laviolette took the loss, facing 42 shots on the night. 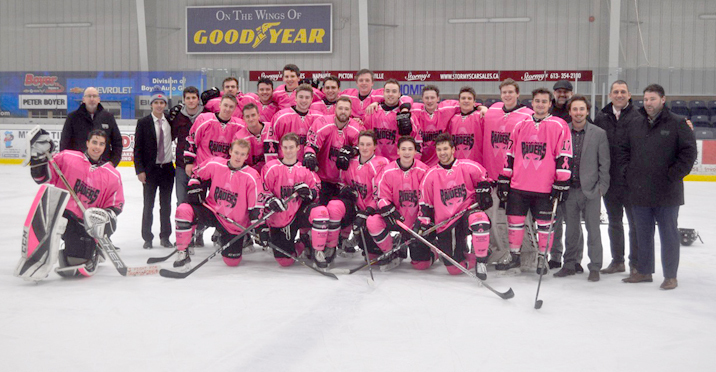 The Napanee Raiders wore special pink jerseys for Friday’s game, which were auctioned off to help fight cancer in the community. Photo by Adam Bramburger. The game worn pink jerseys were auctioned off during the game, raising over $4,000 towards the Lennox and Addington County General Hospital’s chemo ward as well as the Arthur family. Following Friday’s loss in Napanee, the Panthers dropped a 5-4 home game to Clarington. The Islanders meanwhile lost 7-4 to the Amherstview Jets on Saturday prior to Sunday’s loss to Napanee. The net result was no movement in the standings, with Port Hope continuing to lead 31-29 in points. The Panthers also hold an advantage with two games to play while the Islanders have just one, meaning an Islanders loss would officially eliminate them from the playoffs. The Islanders are scheduled to face the Georgina Ice on Friday while the Panthers host the Jets on Saturday. The Panthers’ other remaining game is a make up of a Jan. 20 game against the Raiders which was postponed due to weather. That game is yet to be rescheduled and wouldn’t be played in the event that game becomes meaningless. In the meantime, Napanee’s last scheduled game of the regular season is Thursday, when they travel to Picton to face the Pirates. Puck drop is 7:30 p.m. Following that game they will open a best-of-seven playoff series with either the Panthers or Islanders. Game times are yet to be determined, though Game 1 will be in Napanee. The Pirates, who will finish second in the standings regardless of Thursday’s outcome, will host the third-seeded Amherstview Jets in their best-of-seven. The winners of each series will meet in the league finals.